Once the applicable ergonomic hazard has been identified the next logical phase is to establish the risk factor of that ergonomic hazard to the employee. In the case of ergonomic hazards, it usually translates into a Health risk, keeping in mind health risks can be further segregated into acute or chronic. This can be applied to the ergonomic risk as well. Take for instance an employee executing a manual handling activity incorrectly and twists his body awkwardly while carrying a heavy load, this could result in a hernia which would be classed as an acute health risk. Now take the same employee carrying the same heavy load day in and day out over a period of 5 years while executing improper lifting practices. With the mass amounts of pressure being placed on his lower back (as per downward force calculations) that employee over time can develop any number of Cumulative Trauma Disorders related to the back, neck and shoulder area. This would be classed as a chronic health risk as it had developed over a prolonged period of time. in keeping with the classification of chronic versus acute health risks, employers must avoid the pitfall of assuming that the consequences of one may be greater than the other and treat both with the consideration of “Worst Case Scenario”. In quantification of the risks, Symptom Surveys must be conducted. By utilization and addition of employee medical recodes (Baseline – Monitor – Exit) a Bi- Polar scale can be developed to estimate symptoms from Little or No Pain/ Discomfort/ Fatigue to worst possible pain/Discomfort/ Fatigue as well as estimate the frequency of occurrence. This will help in the quantification of risk as this data would feed directly into the Severity – Occurrence – Exposure formula utilized in this regards. The first step is always to eliminate the Ergonomic Risk, read what the Occupational Health and Safety Act 85 of 1993 states about Ergonomic Risk In most in workplaces however this is not always reasonably practicable, thus the next step of Substitution is often viewed as the start point in these cases. When substitution is not a possibility the common practice of engineering out the risk is sought after. In the case of ergonomic risks engineering controls become the preferred method of mitigation. Stemming from the definition of ergonomics the goal thus becomes to utilize engineering and design practices to “fit” the job to the employee. An example of this would be the implementation of engineering controls at a work station. Work stations can be engineered to be easily adjustable or redesigned to fit the task so that the employee is more comfortable in using them. An example of this would be truck drivers travelling long distances. The cab of the truck these days are designed with the goal of mitigating ergonomic risks presented to drivers, who in the past suffered many upper body related CTD’s due to poor design of the cab and the seating. Another example of this would be to provide a trolley to a worker so that they do not have to manually carry heavy loads constantly. Another example of a mitigation criteria employers can explore before resorting to the issuing of PPE is to create ergonomic friendly work practices. Key elements of this methodology include proper work techniques, employee conditioning, inspections, feedback and maintenance. 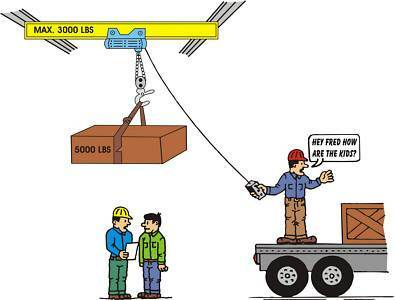 One such example may be to create an ergonomic safe working procedure around a particular task such as correct lifting practices. Once employees have been trained on this, they can thereafter be verified by a competent person on their application by utilization of the applicable checklist described previously. Another easy low cost administrative control that can be instituted is to mandate a break time. An example would be for the IT field or admin clerks who can be mandated to take stretch breaks every 1.5 hours. It is also vital to remember that no matter what mitigation criteria is selected, the applicable employees must be firstly made aware and trained on the applicable criteria. This is often overlooked, especially in the case of PPE such as a common ergonomic related PPE, the Kidney belt. Improper utilization or up keep of this piece of equipment can decrease its effectiveness. Post mitigation criteria selection and implementation, the ergonomic risk can once more be quantified but this time at a residual level whereby the rating of the applicable mitigation criteria(s) is subtracted from the original quantification. The final step is to monitor the mitigation criteria success rate, depending on the mitigation criteria selected. The same documentation utilized in the first 2 phases can be again utilized to determine the effectiveness of the criteria implemented. Any and all deviations must then be corrected applicably and the process as per the requirements of the Deming Cycle must be applied.